Decorate your patio with pretty flowers in a hanging basket planter! | DIY projects for everyone! Home DIY Decorate your patio with pretty flowers in a hanging basket planter! Decorate your patio with pretty flowers in a hanging basket planter! Is your outdoor area needing some colour and life? The best and easiest way to remedy that is by displaying seasonal flowers blooming in various colours in a planter or in a hanging basket! Hanging baskets need a wall or a column to hang from, but the store bought ones are usually too expensive for their simple look and function. Well, if you need one, why not build one yourself! It will save you more than half the cost of buying one from stores plus it’s easy to make! 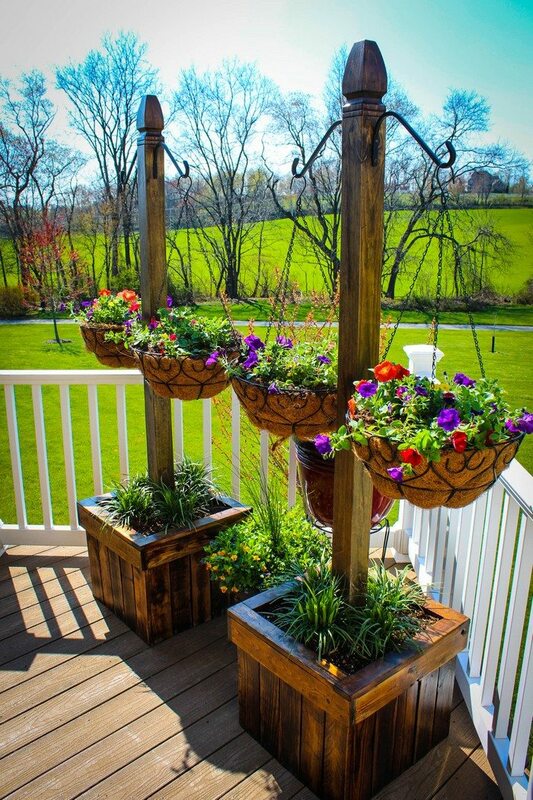 You can simply place your hanging basket column in the ground, but putting it in a planter is an even better idea if you love redesigning your outdoor area from time to time! You can also plant around the base of the column. And since it’s in a planter, you can easily move it around. This DIY project teaches you how to build your own hanging basket column with a planter. Do you need this hanging basket planter for your deck or patio?